Halloween has always been about two things: Frights and treats. So it’s no wonder that there are seemingly endless amounts of DIY snacks and sweets inspired by the witches, ghosts, and zombies of this realm and the next. No matter what age you are, Halloween’s the perfect time to let loose and get crafty with some bewitching and beguiling edible crafts that will be a hit with both the kids and grown-ups in your life. From creepy crawly sweets to eyeball-filled cocktails, these fun projects straight from Pinterest will have you feeling inspired to make some creatively ghoulish dishes for your upcoming festivities. Whether you’re hosting a kids party or unleashing your inner child with the help of some silly, spooky edible Halloween fun, these snacks will help you kick your end of October celebrations up a few notches. Turn everyone’s favorite store-bought cookie into a slightly spookier experience with the help of melted white chocolate, cake pop sticks, and edible googly eyes. Put out the supplies for an easy edible party DIY, or make them ahead of time to add a sugary crunch to your snack spread. Some mashed avocado, black olives, red food coloring, and an artful hand with a paint brush will transform this standard hors d’oeuvre into a super creepy passable snack. Give your guests a fright with the help of these realistic crawling creatures made out of marzipan. This completely vegan recipe will be worth a little extra work and artistic effort for the frightening effect they’ll have on your friends and family. This mummy-inspired appetizer will have you walking like an Egyptian once you wrap your ham and cheese in strips of puff pastry, adding a straight outta the tomb effect to your Halloween party spread. This easy-to-make sweet is the perfect party DIY, as it requires just a handful of ingredients and can be totally personalized by each of your guests. Transform marshmallows into cute monsters with help of candy eyes, sprinkles, and more. There’s no question that the Jack-o-Lantern is the most iconic symbol of Halloween, and with this treat you can put your well-honed carving skills to work on some puff pastry atop everyone’s favorite fall dessert: pumpkin pie. Be warned that this next-level creepy party food might make your guests’ stomachs churn at first sight. With this incredibly simple DIY, you’ll turn plain hot dogs into bloodied severed fingers that are sure to turn heads. This DIY is so simple and fun, even the youngest guests at the party will be able to take part. Melted white chocolate quickly transforms simple strawberries into a parade of ghosts, with totally personalizable expressions. These adorable little creatures can be made before the party and unleashed on your guests for a fun surprise, or customized by your little ones with ingredients like sliced strawberry tongues and sunflower seed teeth. Plus, you get bonus points for offering a healthier snack option. These oozing, cranial-topped cupcakes coated in a blood-red glaze will simultaneously disgust your guests and make their mouths water. Cherry pie filling makes for the perfect gushing insides for these easy-to-create handheld “brains”. This spooky sweet utilizes dark purple food color to recreate a classic poison apple your friends will fear digging into. Complete this eye-popping DIY with actual sticks—rather than skewers—to give the effect of plucking the poisoned fruit straight from the woods. This easy savory DIY, which is perfect for a Halloween-themed dinner party, takes a classic recipe—stuffed peppers—and gives them a fun twist by bringing grinning Jack-o-Lantern faces into the mix. The world’s most famous monster gets a cute recreation with this fun edible craft, which transforms Kit-Kats and mini peanut butter cups into the famous lab-created green monster. 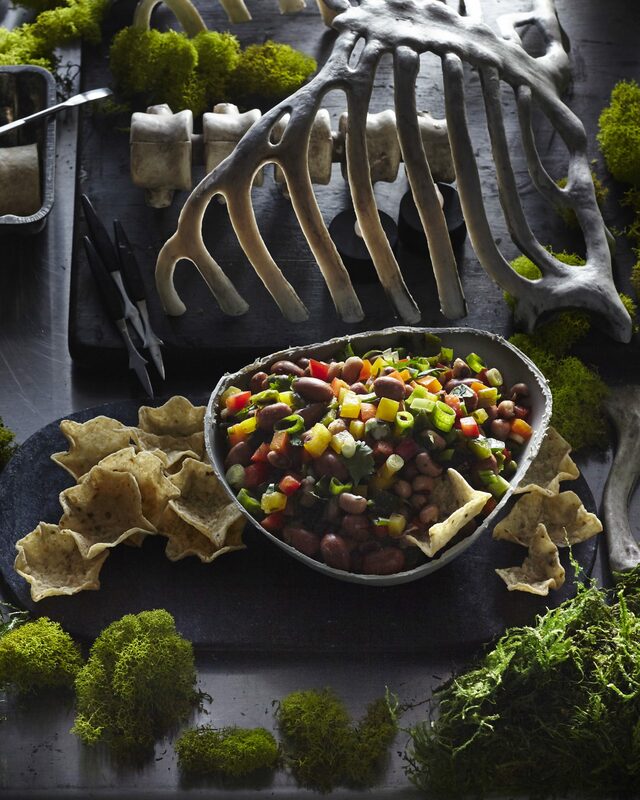 Turn your party spread into a downright macabre affair with this easy-to-make 6-layer taco dip lined with spooky gravestone tortilla chips. Bonus points if you add some of your party guests’ names to the taco cemetery for an extra fright. Kick your cookie game up a notch with some Dracula-inspired “dentures,” made with chocolate chip cookies, marshmallows, and almond slices that help to give this dessert a little extra bite. These sweet-and-salty treats are sure to spook any of your party guests, which will make the effort of hand painting glossy almond “nails” totally worth it. Flex your artistic skills with this creepy DIY and you’ll blow your party guests away. Transform a small pumpkin into the ultimate Halloween party addition by creating a guacamole and queso-filled creature who will be the hit of your party spread. For the grownups in the room, up your adult beverage game with the help of these skin-crawling cocktails that include whisky-filled witches blood and a spiced martini teeming with eyeballs. For more inspiration for your most epic Halloween spread ever, check out Our Best Homemade Halloween Candy Ideas, these easy last-minute Halloween treats, and a Mummified Candy Corn Cake your guests will die for.